Evidence suggests that a white dwarf star has been torn apart by an intermediate-mass black hole. This object is found in a globular cluster, a very old, very crowded grouping of stars. If confirmed, this result would be the first time such a class of black hole was found in this setting. This system is found in the elliptical galaxy NGC 1399, which is in the Fornax cluster. Evidence from NASA's Chandra X-ray Observatory and the Magellan telescopes suggest a star has been torn apart by an intermediate-mass black hole in a globular cluster. In this image, X-rays from Chandra are shown in blue and are overlaid on an optical image from the Hubble Space Telescope. The Chandra observations show that this object is a so-called ultraluminous X-ray source (ULX). An unusual class of objects, ULXs emit more X-rays than any known stellar X-ray source, but less than the bright X-ray sources associated with supermassive black holes in the centers of galaxies. Their exact nature has remained a mystery, but one suggestion is that some ULXs are black holes with masses between about a hundred and a thousands times that of the Sun. Data obtained in optical light with the Magellan I and II telescopes in Las Campanas, Chile, also provides intriguing information about this object, which is found in the elliptical galaxy NGC 1399 in the Fornax galaxy cluster. The spectrum reveals emission from oxygen and nitrogen but no hydrogen, a rare set of signals from within globular clusters. The physical conditions deduced from the spectra suggest that the gas is orbiting a black hole of at least 1,000 solar masses. To explain these observations, researchers suggest that a white dwarf star strayed too close to an intermediate-mass black hole and was ripped apart by tidal forces. In this scenario the X-ray emission is produced by debris from the disrupted white dwarf star that is heated as it falls towards the black hole and the optical emission comes from debris further out that is illuminated by these X-rays. Another interesting aspect of this object is that it is found within a globular cluster, a very old, very tight grouping of stars. Astronomers have long suspected globular clusters contained intermediate-mass black holes, but there has been no conclusive evidence of their existence there to date. If confirmed, this finding would represent the first such substantiation. Coordinates (J2000) RA 03h 38m 29.00s | Dec -35° 27´ 01.40"
We on Earth are following the destructive nature of Black hole or they are getting influenced by us? Thank you... amazing black hole. Great site. Thanks for the comments and I hope you keep looking at the sky. Flint Michigan has had an awesome naked eye sky observatory. The things we can see with the naked eye at first seems unreasonable and totally impossible. However, with NASA reports coming in validating what we are truly seeing is verification enough for me that we're not crazy. I am still perplexed as to why we can see these stellar sights with only the naked eye. I have been specially interested in the interaction between a black hole and other structures in our universe. This presentation adds to a previous view of a collision between two galaxies, which impressed me very much about what is happening in our universe. Thanks for this opportunity provided by your spectacular efforts. Well, I assent to, but I contemplate the post should have more info then it has. Could this be the shimmering star in the sky lately tonight I saw it? At first I thought it might be a plane or something, it looked like it was moving that much, after a while I realized it was indeed a star, but the array of colors and movement or twinkling coming from it really amazed me so I got online to look for answers. Most excellent and kudos in the true meaning of its word. Continuously pleased by nature's trueness. Would there be any intermidiate black holes in the globular clusters around our own galaxy? in alignment relative to the alpha centori system. Most helpful. 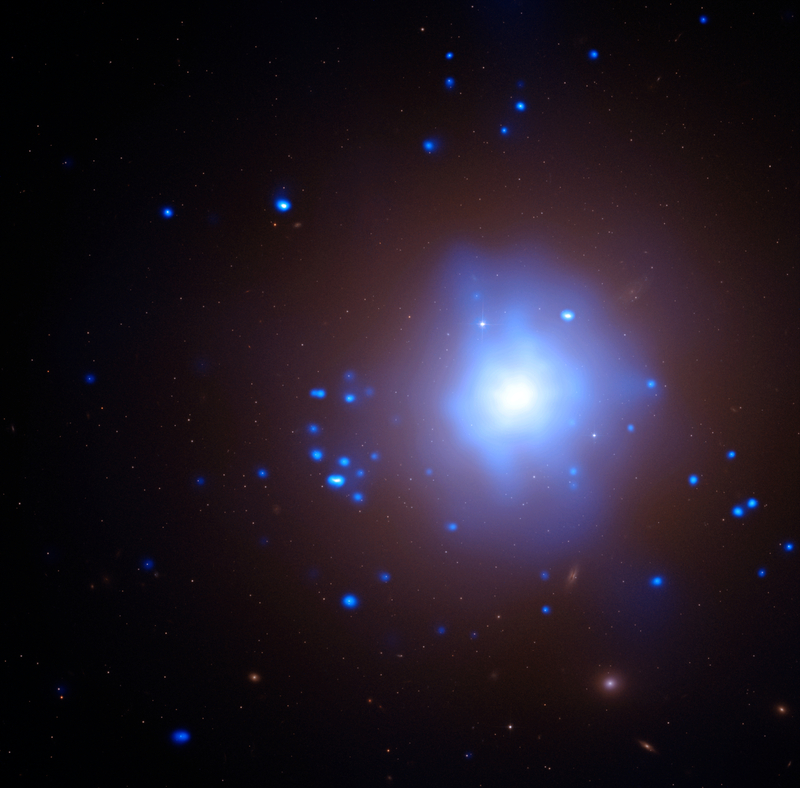 An elliptical galaxy in the Fornax cluster that contains an ultraluminous X-ray source. About 65 million light years from Earth. X-rays from Chandra were overlaid on an optical image from the Hubble Space Telescope. X-rays are blue and the optical data are yellow. In the constellation Fornax (for "chemical funace"), viewable from the Southern Hemisphere.